Mouth consists of lips, gums, tongue and teeth. The infection of any one of these parts course mouth problems. Puppies have 28 temporary teeth, 14 in the upper jaw and 14 in the lower jaw. These deciduous teeth erupt at about three to four weeks of age. Puppies should lose a puppy tooth before the corresponding adult tooth emerges. The permanent teeth begin to emerge at about four months of age. Dogs have 42 permanent teeth, 20 on the top, and 22 on the bottom. Abnormal, defective pet teeth are sometimes one or several teeth may be involved and the concern may be for esthetic, functional, patient comfort or a combination of these issues. Crown or root abnormalities may lead to pulp infection, inflammation and death of the tooth. Systemic spread of dental and periodontal infections can lead to more serious consequences. Visual inspection may offer a working diagnosis. The evaluation must be followed up with dental radiography. One of the most common reasons for a dog tooth infection is a tooth abscess, which is an enclosed pocket of infection. This occurs when bacteria gets into the root of a tooth. Tooth abscesses may happen because of gum disease or if your dog breaks a tooth. The most common culprit is chewing on objects that are too hard. Dogs can also break their teeth through mouth trauma accidental hit in the mouth with something. Even though a dog tooth infection is extremely painful, dogs are experts at hiding pain. Subtle signs of a dog tooth infection include not wanting to eat dry food or hard treats, dropping pieces of food out of the mouth while eating, not chewing on a favorite toy, bad breath, not wanting the face or mouth touched or scratching the face or rubbing it on the floor. With advanced dog tooth infections, you might see drooling, swelling around the eyes or a draining wound near the eyes. Once your vet diagnoses your dog with a tooth infection, you generally have two options for treatment. The simplest and most cost-effective way to fix a dog tooth infection is to pull the tooth known as extraction. This is done under anesthesia. Your dog will feel much better once the infected tooth is out. If you want to try to save the tooth, another option is a root canal filling, must be done by veterinary dentists who have the special skills and equipment required for this procedure But unfortunately this is not done in Sri Lanka and there are no qualified veterinary dentists. An ounce of prevention is worth a pound of cure. You can save your pet’s teeth rather than have them extracted if you provide preventative dental care. The annual physical exam must include an oral exam to recognize problems with teeth, periodontal disease, and other oral diseases. The dog should be subjected to comprehensive oral examination by a vet begins by observing the face, recognizing that there are normal breed variations but carefully observing for abnormalities such as malocclusion (wrong alignment); evidence of facial swelling or discharge from draining tracks; excessive depositions of calculus (tartar); avoiding chewing on one side; unwilling to chew due to pain; any fractured (broken) soft tissue problems of the gums, buccal mucosa (inside of the cheeks),hard and soft palate (roof of the mouth) unusual odor or sensitive teeth. Some animals won’t allow a safe oral exam during the physical exam. The oral exam should be performed with sedation or under anesthesia for aggressive or fearful pets. Brushing should be performed daily and if unable at least three times a week. •Use a specially designed dog toothbrush. •Never use human toothpaste, baking soda or salt. Instead, use pet-safe toothpaste with a flavor favorable to your dog’s taste buds. 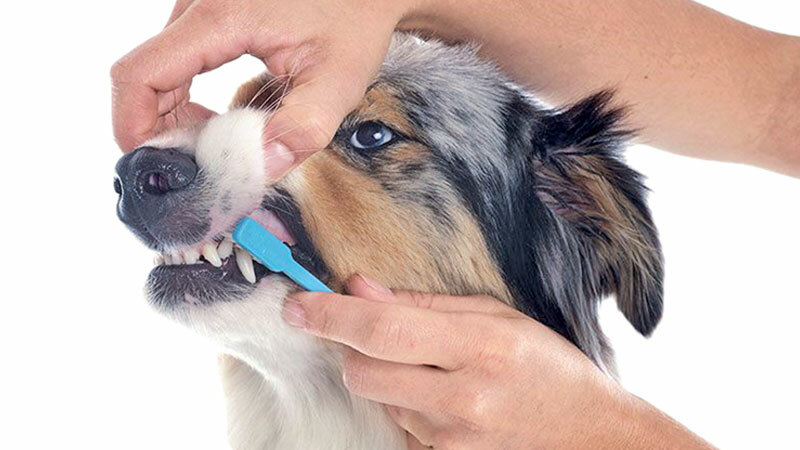 •Give your dog a small sample of the toothpaste to introduce the taste. •Lift the lip to expose the outside surfaces of your dog’s gums and teeth. •Brush with gentle motions to clean the teeth and gums, as you would your own. •Clean the outside (cheek-facing) surfaces, as most pets will not allow you to brush the inside surface of the teeth. •Be sure to reach the back upper molars and canines, as these teeth tend to quickly build up tartar. •Reward your dog with play, petting or a favourite activity to positively reinforce the brushing process. Dog mouth wash is a tool that you can use to keep your dog’s dental health in tip-top shape and reduce the bad breath. The mouthwash is specially formulated for dogs so that it is safe to ingest, and they come in a plethora of flavours. Each brand has a different application style such as water additives, sprays, gels and rinses. To start, consider your dog’s temperament. Some of the application methods available require some level of cooperation, where others are not as involved. Water additive and rinse mouthwash are placed in a bowl and allow the dog to drink. Make sure the amount should be used according to the label. If the dog is calm and friendly use spray type mouthwash or apply gel in the gums.